Do you have a Bur-Mar's Shoes or Dansko experience to share? Email us, and we will post it on our site! The gift was fantastic, the professionalism of the artist is apparent and greatly appreciated. It did arrive on time for Christmas. Hopefully we place more orders in the future. Wish you folks happy new year and most importantly stay warm. Love them! Pleasure doing business with you! I just wanted to let you know that I received the shoes I ordered today ...and they are absolutely amazing. My wife and I are both from South Dakota (I grew up in Sioux Falls, she in Parkston) and we still have a lot of family there whom we visit often. We now reside in western Wisconsin (or lately, the "North Pole II"). Anyway, I just wanted to tell you that I am so pleased with the shoes and how beautiful they are. I did not expect them to be hand painted as they are, and my wife is going to love them. 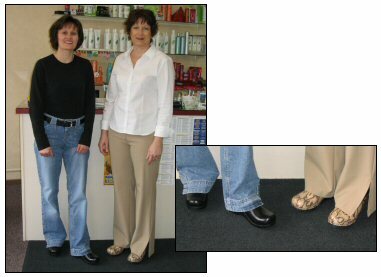 My wife stumbled upon a picture of these shoes while doing a google search for Dansko shoes last year. She couldn't find them on any of the major websites (Dansko, Amazon, Zappos, etc.) At the time, she (nor I) realized that they were hand painted, and were not a print offered directly from Dansko. I did some extra digging, and finally found your website ...and was thrilled to find the "butterfly" shoes that she had seen a picutre of. I purchased the shoes for my wife as a surprise birthday gift. She loves Dansko shoes and already has like 5 pairs (shoes and sandals). She often wears them to work and she is going to be blown away when she sees them. If possible, please pass on my thanks and appreciation to Ms. Weber Green. Her work is fantastic and I love the added touch of having her name and series number on the shoes. My wife is going to love having an essentially one-of-a-kind, hand painted shoe that cannot be purchased in a store. Thank you again for a great product and great service. I placed an order with you last week and received everything fine. I have never ordered from your company before. I found out from the stores in my area that the confetti Dansko was very limited so I went on line. I am very leary of ordering from a company I don't know anything about. I took a chance with Burmar Shoes. I was well pleased. Thank you for your e-mail response on my order status and your prompt service! I will recommend you to others. Kathy W.
Terry Mach and JoAnn Lehrkamp (pictured right) of The Cutting Edge Salon in Aberdeen, South Dakota love their Danskos! "They are the greatest supporting shoes I can find," said Terry, "They are great to stand in and have helped my lower back problems." Cathy Ivey, of The Ivey's For Hair says of Dansko, "After 30 years of standing behind the chair, my hips, legs and feet have been giving me problems. My clients in the salon kept telling me to try Dansko. My hip pain went away, and no aching feet! Now I wear them 90% of the time at work and at home. If I wear other shoes, my arches and hips start to ache." 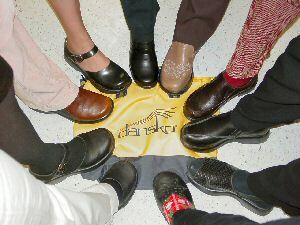 Teachers in the Frederick School District, Frederick, South Dakota proudly display their Danskos. Pictured feet belong to Janelle Barondeau, Jackie Brokaw, Renee Brooks, Amber Haselhorst, Liz Labesky, Cindy Rall, Carman Ruenz, Sara Sumption, Ann Wampler, Roberta Yeske and Tonya Zinter. Ann Wampler, teacher at Frederick, told us "All I can say is that since I bought my first pair- when Bur-Mar's Shoes started selling them years ago-I have been coming back regularily to buy more because they are comfortable, supportive, stylish and I can wear them all day. Plus, I really trust Kathy's judgment and recommendation for my shoes.